The clique you can trust: PURPOSEFUL LIFE! Don't wear a frown yet! I'm not trying to preach neither am I trying to sound religious. But the truth be told! 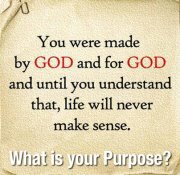 Since it was God who created you, and you know He definitely had a purpose in mind before He made you, isn't it only normal for you to ask Him to show you what your purpose is? Well, that's if you've not discovered your purpose yet. But if you have, then congrats! But for those who are yet to do so, it's important you ask your creator to show you what He had in mind when He brought you into this world...because it's only when you have discovered purpose that life can begin to make plenty sense...God loves you so much and He wants you to enjoy life by living a PURPOSEFUL LIFE!!! #mythoughts #PreshnextSpeaks.